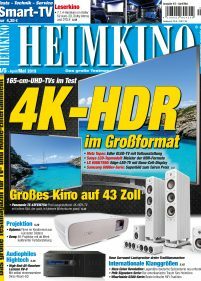 When it was first published in 1993, Heimkino was the first special interest magazine in the German-speaking market to be dedicated exclusively to the technology of home theater and the cinema experience at home. Thorough and detailed test reports on all kinds of home theater products, especially Flat TVs, projectors, electronics and loudspeakers, make up the most of Heimkino’s content, but it also features regular reports on home cinema systems built by its readers, plus industry and trade show news, DIY and tuning tips and reviews of all major releases on DVD, Blu-ray Disc and HD DVD. Heimkino is aimed at all kinds of home theater enthusiasts, whether they are experienced hobbyists or beginners, and whether they have dedicated cinemas or enjoy the cinematic experience in their living rooms. Its readers expect - and receive - help in their buying-decisions as well as background information, tips and inspiration on all aspects of their hobby.